Astro Physics 130EDT f/8 - how to really find out if air- or oilspaced? 285 = 285th 5 inch telescope made by Roland (NOT the 285th in this series, nor the 285th in this particular run, but the 285th 5 inch telescope of all types ever made by Roland up to this point). 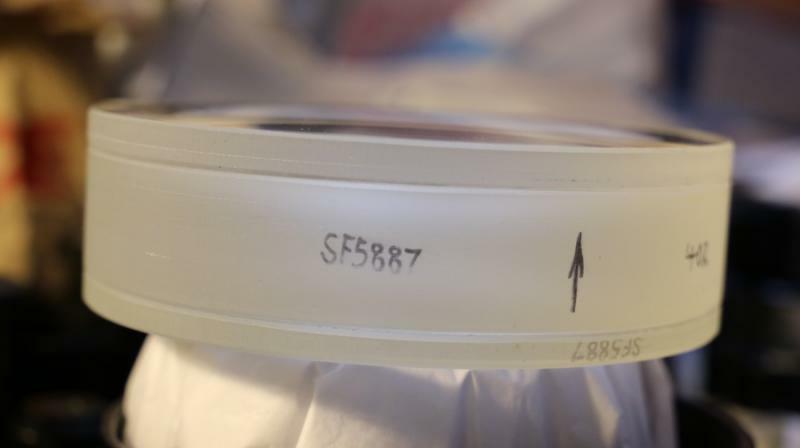 During a run, the serial numbers are only added as each set is tested and complete - and that is why the tube is not labelled with a serial number, only the edge of the lens set is, written there by Roland. Other marks which can be seen, especially on the 'older' optics are alignment marks for the rotation of the elements. From everything I have gleaned over the years, there were 2 production runs of five inch Starfire EDT telescopes and both were 100% oil spaced. There were several prior makes and smaller runs of 5 inch telescopes which were NOT EDT, some of which were air spaced. The first runs of 5" EDT were possibly made from some surplus 155mm glass which did not make the cut for edge defects or inclusions or whatever reason. These telescopes are labeled f8 on the lens cell but are nominally f8.35. (155mm f/7.1 cut down to 130mm results in f/8.35). As well, there is absolutely no point in remaking tooling to build slightly different focal ratios. These telescopes are effectively identical to the later run of Starfire f/8.35 EDT scopes. At any rate, as a visual observer, Thomas Back absolutely loved the Starfire EDT. I have a friend with the f8 and another with the f8.35. At some point I hope we can get these scopes together for a night of side by side viewing pleasure. "Awesome, so now we 'know'. For AP130EDT telescopes, 131xxxEDF or 131EDFxx are the serial numbers of the AP130EDT f8.35 using FPL-53. We can make an assumption that the first run, likely ALL engraved with F8 on the retaining ring, goes from 131000EDF to least 131026EDF, and if Roland's comments can be relied upon, likely to around 131032EDF. The second and final run marked 131EDF33 (?) to at least 131EDF60, and likely to 131EDF64 is engraved with F8.35 on the retaining ring. Not definitive but probably quite close." Thomas Back's own AP 130 f8.35 was from the first run; the TMB 130 f9.25 was designed and produced after that run and before the second run. That sequence is described in a fascinating account of the history of TMB's 130 f9.25 by 'MrGrytt' (Harvey), relating his own involvement in it. He reported that, disappointed in the apparent discontinuation of the AP 130 f8.35 after the first run and before he had become eligible to buy one, he pressed Thomas Back to design a substitute. The result was the TMB 130 f9.25, and Harvey obtained essentially the first available production model of that scope, then was informed of the second run of AP f8.35's and the rise of his application for one to the top of the AP list. So, in the end, he got one of those, too! The story was outlined by Harvey in CN thread <https://www.cloudyni...to-tmb-optical/> and is well worth reading. "At any rate, as a visual observer, Thomas Back absolutely loved the Starfire EDT." According to Roland all early FPL-52 EDT’s used a mating element that resulted in perfect color correction, that mating element later became unavailable in sufficiently good quality suitable for use in astronomical telescopes, I believe that happened sometimes in mid nineties, the next best mating elements that was used in later FPL-53 triplets required some minor aspherics to make up for less than ideal mating element available at the time. As Vahe noted Roland has indicated that "ZKN7 is the ideal mate for FPL53 theoretically," but that there are significant problems in obtaining satisfactory batches of it and working with it, and that, eventually, he "totally abandoned this material." <http://www.astromart...ws_id=&page=>. In the 'History of Astro-Physics Lenses' cited in my previous post here, Thomas Back indicated that "The first EDT design used ZKN-7 crown glass and FPL-52 ED glass. The last runs of the smaller EDT models used the same crown glass but FPL-53 ED glass. They were even better corrected for monochromatic and polychromatic aberrations." This implies that satisfactory ZNK7 could still be obtained for the 'smaller' AP scopes. So it appears that some production AP models did involve the 'ideal' pairing of ZNK7 with FPL-53, but it's not clear which ones. The very well corrected f8.35's admired by Back (and sibling 155 f7's) might have been among them, but I have not found an explicit statement confirming that. I thought for a long time to have one of the air-spaced scopes - but finally I had not as you can read above. So I never have seen a real air-spaced 130EDT until today and now start to believe that all 130EDT´s are maybe oil-spaced just as M13 Oberserver mentioned. The correction of both of my EDT´s is very good! I have a Takahashi TSA-102 as well as a TOA-150 which are well known as some of the best corrected scopes around - both of them have a perfect startest. Until now I still have not compared them 1 to 1 against the EDT´s - but I will for sure! Edited by donadani, 16 December 2017 - 05:30 AM. I really am the only guard the oiled in vertical position when not used? In fact when I detect that in the star test the disk is not completely round because it is stored horizontally, I read here in cloudynights that the oiled ones have to be stored vertically, as my friend told me. Although the amount is minimal oil I understand that everything stays in one place causing this image that is only seen extrafocal. What I saw right now is that both EDT scopes are very, very good corrected in terms of color- as well as in terms of spherical correction. I would really love to compare them directly to an f/8.35 example too to see if there is any difference..."
The choice of glass used in various 130 f/8’s is not necessarily the entire story, there is one other variable that defines their quality. The older EDT’s, all of them, date back to pre-interferomety period of AP, Peter Ceravolo set up the interferometer for AP sometimes in mid nineties, so I assume that the better corrected late model f/8,35 was figured with interferometer and in green light. Now, this is just a guess on my part, but my guess is based on a lens evaluation report that I received from AP specifically for my 155 f/9 EDT, in that report Roland stated that my lens was originally figured in yellow light, that is 593 nm, I am simply assuming that all pre-interferometry triplets were all figured in the same light. How much of a difference all this makes? I do not know. Vahe is right again. The introduction of interferometry for lens testing was noted in Thomas Back's 'Brief History of Astro-Physics Lenses' as an important step, along with use of an 'Opticam CNC glass surface profiler and an U of R magnetic polishing machine,' around the time the new EDT and EDF designs using FPL-53 glass were developed. There has been the suggestion that this degree of hand re-figuring (including aspheritization) is not required for the new, air-spaced, all spherical designs AP is now producing. One also wonders whether interferometrically guided re-figuring could now be computer automated, or perhaps already is, with the expertise of opticians such as Roland 'taught' to machines. On the other side... I store my CFF-185 (that is oil-spaced as well) in vertical position too - just to be on the safe side! - and btw. the box allows this in this case too. Vahe, Larry - do I understand your points right here - that you guess the newer EDTs as well as all the EDFs and GTs should be "better" as they are corrected to green light (instead yellow for the older EDTs) and inteferometry is used in the manufacturing process? Well of course technology steps forward but I´m not sure if this is true in generell... just using interferometry is not a guarantor for a top optic and I´m pretty sure some "old" scopes are better then some "newer" ones - but of course I´m with you that it could help. My reference for a good optic is an older, pre-interferometry-era-made and hand figured Takahashi FC-100N - that was measured by Wolfgang Rohr with a strehl of 98,9 in green light - enclosed you find the report. Next to that I learned that if you wanna have a really good analysis with interferometry - you should do the test more often in different directions (at least two, shifted 90° better more!) to see all the errors of a lens or mirror. My CFF-185 for example was reworked because the preowner saw some noncircular stars in one corner of the field. As it came out after some research this error was only visible at a specified direction on the interferrogram. To correct it the complete lens was reworked (coating removed, repoolished, new coating - be sure, not many companys would do that!!!). The result now is a perfect lens in any direction of the interferogram. Edited by donadani, 17 December 2017 - 06:19 AM. Coming back to the EDT´s we are talking about here - I was just suprised, that the startests of my two samples are so very, very close that I couldn´t see any difference - all that without interferometry and at least two years between their manufacturing - and btw. both are very close to my reference scopes "
My opinion; interferometry does not necessarily guarantee quality, interferometry if used properly will result in consistency of the end product. One example that I can offer here is for my own 155 EDT f/9, there is a test of this Apo on Astro-foren.com under “A1041 Astro-Physics EDT APO 155-1395 Super-APO anno 1990 f9”, check out the test results, this is a sample of pre-interferometry lens that tested exceptionally well, on the other hand my own 155 EDT was re-tested by Roland with interferometer using green light and the results were 0.925 Strehl, that is unacceptable to say the least, this example proves that there could be considerable variation in quality in pre-interferometry lenses. I could not find a similar test for 130 f/8 but your visual tests tells me that what you have is one of the better ones. As for figuring an Apo in green light versus other wavelengths consider the fact that Zeiss APQ’s were figured in white light, primarily optimized for visual. The bottom line, you can safely drop all this technical mumbo-jumbo and enjoy the views. Thanks for pointing that out Larry. In this case I wanted to concentrate on the original runs of the f8 labeled EDT scopes. Further to this, the serial numbering schemes across all of the Astro-Physics' scopes seem to have some other variations from time to time as well. I don't even know if Roland could sort it all out exactly at this point. I hope he kept some good records LOL! Enough to know he made excellent telescopes and to be able to enjoy twenty plus year old optics performing comparably to competing current high end apochromats. Edited by M13 Observer, 17 December 2017 - 12:03 PM. Enough to know he made excellent telescopes and to be able to enjoy twenty plus year old optics performing comparably to competing current high end apochromats. I could just compare one of my EDT´s against a EDF GT. For high mag. visual on the moon I prefered the views in the EDT as they where a bit more steady, calmer and so easier to see. I believe the longer f-ratio of the EDT´s is a big plus for visual only. No difference in details. Color was no theme at any magnification with any scope. But didn´t looked explicit for it - will do that maybe later. So for just visual I prefere the EDT over the EDF GT - for any photo ambitions of course the EDF with flattener will be preferable. There was no winner and no looser - but some are better for this and others better for that. All of these scopes are outstanding! "So for just visual I prefere the EDT over the EDF GT - for any photo ambitions of course the EDF with flattener will be preferable." Not necessarily, check out the image of M45 by Chris Cook taken with 130 f/8 EDT. Biggest plus of the GT - where no other scope can beat it yet for sure - in my view is portability!!! saw one taking it in three pieces and take it by hand luggage with ease when traveling by plane - you can´t do that with an EDT or any other scope in that class - nor that easy with the new GTX - really great "little" scope! EDIT: Stop!... - you CAN do it!  ...if your name is "nicknacknock"
Edited by donadani, 21 December 2017 - 04:39 PM. My 130EDT is serial #SF58227 made in May 1992 and from what I can gather here on CN and other online sources, it is a FPL-52/ZKN-7 design. Do you painted the lenscell adapter by yourself or is that original from AP? You changed from a EDF-GT to the older EDT and as I see mainly for photo is that right? but why? wasn´t you satisfied with that GT? That EDF´s faster f-ratio should be a pro to keep exposure time low for any deep-sky object - shouldn´t it? I had the GT for about 8 years and loved it. I was basically looking for a bit more FL. I also bought it for planetary viewing when I don't have a camera attached. Saturn last summer was pretty sweet at 260x. I'll probably keep the EDT. She's a special scope. The lens cell has always been white. Roland produced several scopes with white lens cells in the 90's. Most of them seem to be in the 1991-1994 range. 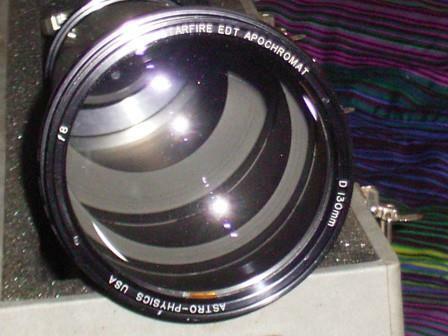 The 6" f/9 doublet that he made for a very short time also had a white lens cell. In early1991 I ordered an 127 F8 starfire. Half way through the year I received the news that I would receive a 130EDT Starfire, as this model was replacing the 127mm Of course I was quite pleased about this at the time. The scope was shipped on 30th December 1991 - serial number SF 58197. It must have been one of the earliest of the EDTs. Kept the scope for 22 years, spending many wonderful nights with it. I always thought it was an oil spaced design, though looking through the original paperwork, nothing indicates this. As an additional data point, I have a pre-ED 5" F8 Starfire, S/N SF5887. Not sure the production date but it has the white tube, not the earlier blue tube. Jeff, Is that a typo? Is it perhaps SF58187 which would make it 10 scopes before mine (pictured)? Thanks for confirming the number Jeff. How to work out AP's serial numbering system? From what I can gather, AP made around 40 127mm F8 Starfires, before making around 120 130EDT's. The numbering system is far from sequential ! Amazing photo of the triplet lens. Now I know why the front end is so heavy. Yes! great photo - thanks! Intersting that the numbers are written in different directions on hte middle and lower lens - always thought it´s some kind of mirroring effect when looking for them from outside. Not so much fun with this one Chris. This old Starfire was in terrible shape when I got it as part of a deal from an estate. Even though installed in the OTA for almost 15 years, the dew cap was off, the lens was left uncovered and the focuser uncapped. The front surface was completely covered in what I hoped would be just dust. The center of the rear element was also covered in dust and.....spider webs. Also what caught my eye was that I saw no Kapton tape on the edges of the lens block, like you see in the photos above. At first, I though it might be airspaced but saw no spacers between the elements. So I was very suspicious and thought the lens may have been tampered with. As the OTA was part of the "package" with a couple of boxes of other stuff, including an AP 400 mount with the quartz drives (but no hand controller), I priced the entire deal so that the OTA was essentially free, that way there was no risk to me and I could part it out if I had to. When I got the scope home, I removed the lens block from the cell and very carefully cleaned both surfaces. Well, they came out looking brand new. . and I photographed it as I thought it strange that there was not Kapton tape on the edges and it appeared to be cemented together. There was also no buffer between the lens block and the cell's interior metal wall. More suspicion. I then reinstalled the lens block, collimated the focuser with a laser (did not need adjustment) and collimated the lens with a Cheshire eyepiece. I was able to test it that very night (which, around here, is unusual when I get a new scope). And the star test was terrible, with complete mush on one side of focus and sharp rings on the other. I could not though find any astigmatism and color correction seemed fine. The double, double actually looked rather good at high power with no signs of coma. I suspected a turned edge and I verified that in DPAC along with a little bit of SA in green. I made a 4.5" aperture stop and that cleaned up the star test very nicely. In DPAC there was now no turned edge but still a bit of SA in green but yellow-red looked very good. So I got in touch with Christine at AP (She has always been incredibly helpful with the older equipment) and forwarded my information to her and she forwarded it to Roland. He too suspected the lens had been tampered with and that the cement may be stressing the lens, causing the turned edge. He suggested just stopping it to 120 mm but I could also return it for service where he would take it apart, realign it and oil & tape it....but it may or may not relieve the stress. But I want a 127MM Starfire, not a 120MM one, so I took the chance and returned the lens a couple of months ago. Roland confirmed what I saw and the lens was inducted into the service cycle, which can take a while as Roland works returns as time permits him to do so. As part of my communications with Roland, he confirmed that this lens was corrected more towards the yellow-red end of the spectrum rather than the green-blue end which was normal for this vintage lens. Nice! sn87. I wonder what the sn of the first FPL52 based 130 is? Is the retaining ring engraved and if so, is it labeled 130mm? Edit -> Ah, I see in a follow up post that it is a 127mm / 5". Is the cell retaining ring engraved with mm or inches or neither? Truly interesting stuff. Edited by M13 Observer, 24 December 2017 - 01:57 PM.